Vinyl skin manufacturer dbrand is usually pretty quick to update its portfolio with vinyl skins for all the hot new flagships, but in the case of the upcoming Galaxy S9 and S9+, it's extra quick. And rightly so, as the upcoming high-profile flagships from Samsung's camp are definitely the most anticipated phones for the first half of the year with literally nothing coming close to them. Thus, don't act surprised when we tell you that dbrand has already primed up its neat combo skin builder with support for the upcoming devices, allowing soon-to-be users to customize and spice up the looks of their future devices handsets in advance. As usual with dbrand, we have a rather similar set of skins that have been available for almost all supported devices for ages, ranging from the good ol' carbon fiber ones, stone, matte, metal, leather, and finally, wood. Combining these as per your desire is pretty easy and straightforward, which is a great feature of dbrand's website. 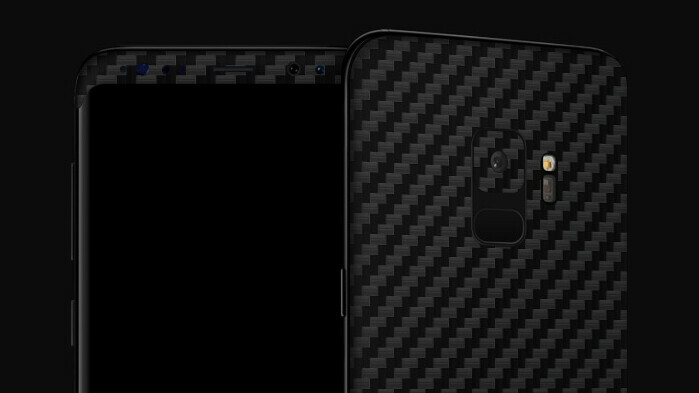 Now, we know what you're thinking, dbrand's website usually has a placeholder device showcasing the skin combo you've chosen, and yes, there's such a placeholder for either the Galaxy S9 and the S9+, but these won't reveal any more info about the devices than we already know. Yes, they too feature the fingerprint scanners right below the cameras similarly to the Galaxy A8 (2018) and A8 Plus (2018). dbrand's skins for the Galaxy S9 and S9+ are now up for pre-order and will hopefully ship before your new Galaxy arrives. A full skin will usually set you back below $20. Probably the side bezels will be thicker than S8 but also impossible to stick a vinyl on them. You could be right. My observation was that Dbrands renders here contradict @evleaks renders. whether pepple hate it or love it, I think Evan Blass's leak might be real. I mean his credentials. The Evan Blass renders of galaxy S9 were fake ! Period. meh... have the s8plus am not super excited abt the same design..